For some time I have wanted to see the abundance of amphibians found in the Iberian peninsula, and several years ago I was fortunate enough to spend 6 months in Spain. 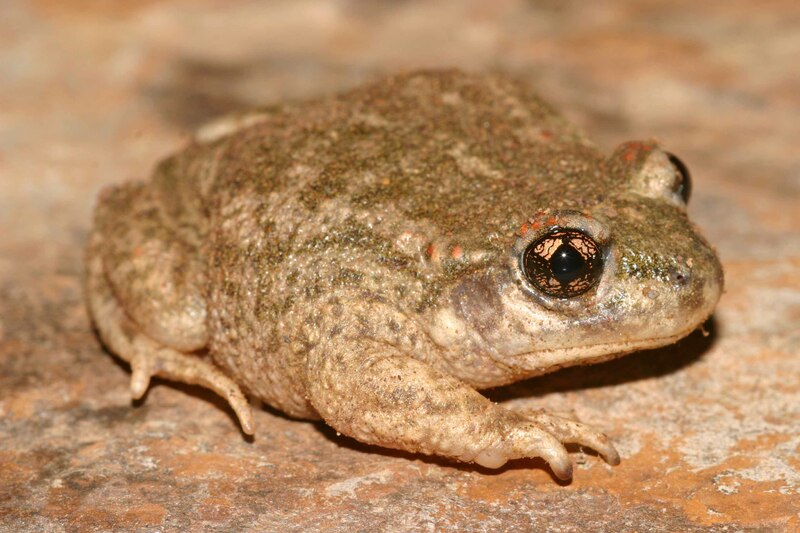 However, due to the dry climate of the Murcia region where I studied I was not able to see many amphibian species, a further trip to Andalusia allowed me to see a few additional species but I still felt the area deserved another dedicated trip. The southern coast of neighbouring Portugal seemed a fantastic choice of a destination to observe amphibians, like in the southern parts of Spain, most species are more active and breeding during the winter. Together with fellow Brit Carl Corbidge we decided to spend a week in the famous Algarve in early February, we were hoping to have some rain which would help us to find many species. Of course we were still planning to dedicating some time to finding reptiles, although many species are not particularly active during the winter months. Despite our hope for rain in the end we did not get a single drop from the heavens during our week in Portugal, instead we had nice sunny weather throughout with no windy days and average afternoon temperatures of around 17-18C. Whereas some nights were quite warm, others were painfully cold almost reaching freezing on some occasions. Despite the relatively unfavourable amphibian weather conditions we observed all 12 species found on the southern coast of Portugal, although some proved very tricky to find and involved a lot of stone turning to locate them. In addition we could find only 8 species of reptile, not surprising for the time of year, but we were pleased with several findings of Mediterranean chameleon (Chameleo chameleon) and Southern smooth snake (Coronella girondica). For some valuable hints for our trip we thank Frank Deschandol and Jeroen Speybroeck. An extra special thank you must be given to Mirjam van de Vliet, without whom we would surely have not found all amphibian species. We were fortunate enough to spend some days in the field with Mirjam whilst she collected amphibian samples from tadpoles for her PHD work which allowed us to see some great ponds and wetlands. All photos are (C) Matt Wilson unless otherwise stated. After driving over from Sheffield on Saturday, Carl spent the night at my place before an early morning flight from Liverpool to Faro, the biggest town in the Algarve. After picking up our reliable Seat Ibiza rental car we drove to our fantastic accomodation in Moncarapacho, a beautiful villa overlooking fantastic Mediterranean countryside. On the bumpy drive up to our accomodation we had a quick search. Flipping over some stones I found three small Natterjack toads (Bufo calamita), our first amphibians of the trip! 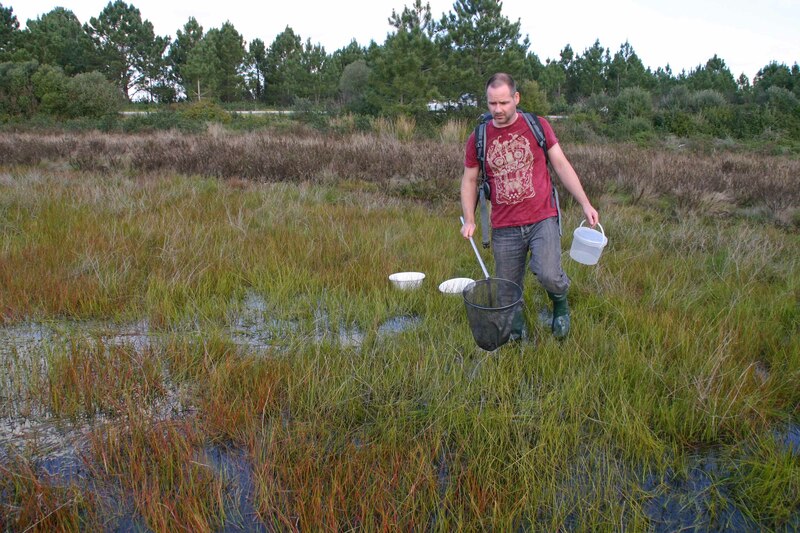 After dropping off our luggage at our accomodation we immediately set out to the coast not far from Faro where we explored some pine forested areas with a small wetland. After flipping some pieces of tin and wood we found our first reptiles, two Worm lizards (Blanus mariae) and several Moorish geckos (Tarentola mauritanica) together with two smallish Large psammodromus (Psammodromus algirus). Soon afterwards we stopped at a nice pond where there was an abundance of Spanish terrapins (Mauremys leprosa), followed by a orange Viperine snake (Natrix maura) that Carl found under some stones. After photographing our first snake of the trip I spotted the find of the day, an adult Mediterranean chameleon (Chameleo chameleon) sitting in a bush :-). After a nice afternoon of exploring we arranged to meet with Mirjam at a local restaurant and talked about our plans for the next few days. After dark Mirjam showed us some temporary ponds near Faro, it was however very cold indeed so only some tadpoles of Western spadefoot toad (Pelobates cultripes) and a single adult and tadpoles Natterjack toad (Bufo calamita) were found. and also two Worm lizards (Blanus mariae). Weird creatures! 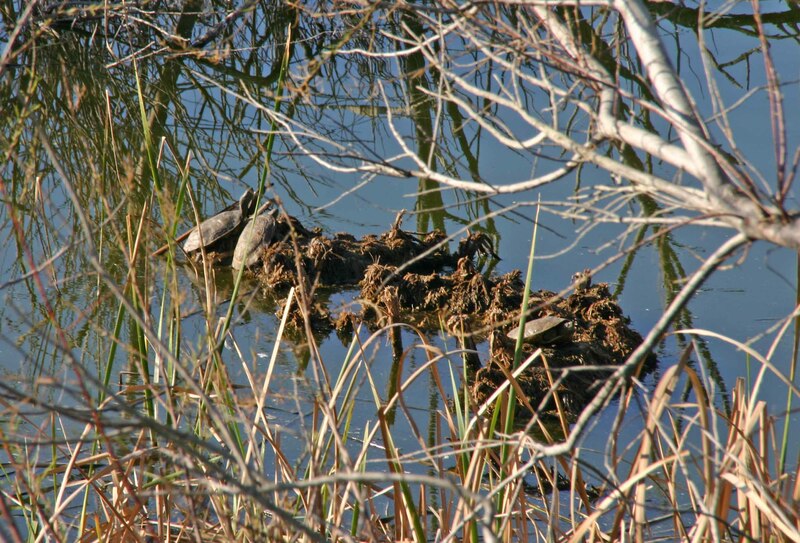 Spanish terrapin (Mauremys leprosa) and European pond terrapin (Emys orbicularis)Shy buggers! After our disappointing night out in the cold, we were worried about the prospects of finding many nocturnal amphibians in such temperatures. However, we decided on this day to try to find a species that doesn’t mind cold weather as much as the others: Algarve fire salamander (Salamandra salamandra crespoi). Our plan was to visit the Serra de Monchique at night, but on the way we would stop off for some daytime reptile hunting at Carapateira, a wonderul sand dune dominated habitat on the Atlantic coast. Searching around some areas behind the dunes we found a well with some large Iberian water frogs (Pelophylax perezi) inside, followed by a couple of Moorish geckos. Exploring a rocky hillside Carl found a juvenile Southern smooth snake (Coronella girondica) under a stone. After some lunch we headed towards the Serra de Monchique, the highest point in the Algarve at 900masl. We sat in a local bar as we patiently waited for nightfall before heading out with our torches to a rather fast moving mountain stream. Again it was very cold, but after only a few minutes Carl shouted that he had found a Fire salamander! The specimen had just lifted its head from beneath the leaf litter, it would however be our only adult specimen, as after another hour or so of searching we didn’t find anything else. Some rain would have surely allowed us to observe more salamanders at this mountain location. Today we were joined by Mirjam, as we planned to have a nocturnal amphibian hunt close to Vila do Bispo on the Atlantic coast. Again we stopped close to Carrapateira during the daytime, where we came across a small pond in a field. Mirjam caught here some well developped tadpoles of Parsley frog (Pelodytes ssp) that could soon be regarded as a seperate species in this area. Searching around the pond I found an Iberian painted frog (Discoglossus galganoi) beneath a stone. At lunch time we met with Spanish biologist Jesus and his colleague Pedro who were studying the Parsley frogs, and we then made our way to a large temporary pond where they would take some samples from various tadpoles. After wading around in the a pond for around an hour or so, between us we caught more than enough tadpoles of Pelodytes for research. At dusk we made our way to some more temporary ponds, and under a stone slab I found our first Mediterranean common toad (Bufo bufo spinosus). Searching around with our nets in a slightly deeper pond we caught some larvae of Ribbed newt (Pleurodeles walti) and an adult Bosca’s newt (Lissotriton boscai). As night fell the Mediterranean tree frogs (Hyla meridionalis) started calling all around us and driving down a sandy road we found an adult Natterjack toad and my first adult Western spadefoot toad (Pelobates cultripes) 🙂 Jesus and Pedro started making their way back to Seville, but myself, Carl and Mirjam carried on searching for a few hours. Many, many many tree frogs were observed, together with several more spadefoot toads and natterjacks, and on the way back to the car, a Southern marbled newt (Triturus pygmaeus)! We called it a night around 11pm and started the 1h30 drive back to Moncarapacho for a well deserved rest. A slightly warmer day, myself and Carl decided to try and find the Iberian midwife toad (Alytes cisternasii). We left the coast and drove inland to some beautiful hills with very few people and only the occasional village. First we headed towards a spot shared with us by Jeroen Speybroeck, but on the way we stopped at a nice looking river which connected with a much smaller brook. This looked like a good area for midwife toads and after entering a small valley, I found several tadpoles swimming in small pools of water of the desired midwife toad. We decided this would be our first nocturnal destination after nightfall. However, with daylight still remaining we tried to drive to Jeroen’s spot, a very bumpy road almost caused severe injuries to our poor little hire car but eventually we made it. 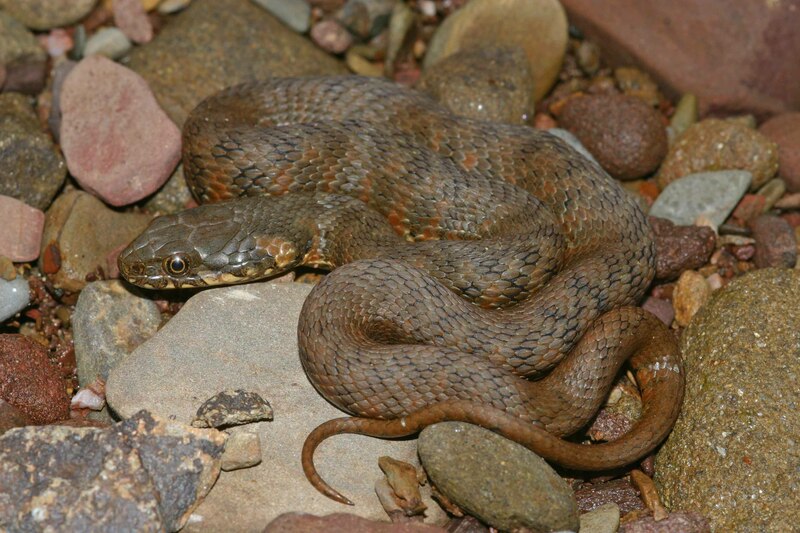 After searching around, the only thing we could find was a small Viperine snake. Driving back towards the coast we stopped at a nice restaurant for a bite to eat and then waited for dark. Driving back to the hills we stopped the car, and turned off the engine from the mountain road to listen for midwife toads calling in the valley below. Sure enough, I could hear many adults calling to each other with their fantastic sonar-like beep of a call. Entering the valley with our torches we immediately found a male midwife toad carrying eggs, this was soon followed by several well-developped larvae of Fire salamander and two more midwife toads which were located by turning off our lights and moving in the direction of their ‘beeps’. We were very happy with our findings and had a rather earlier night than usual on this trip, heading back to the car we found two large Common toads. Today we were joined by local biologist Joao, from the university of Faro, together with Mirjam. Our first visit was to the temporary ponds that we visited on our first night, but this time during the day. Again many tadpoles, Iberian water frog, some adult tree frogs and Large psammodromus. Searching some pine forested areas we found some more moorish geckos and several worm lizards. Driving inland we stopped at a small river, where Joao caught our largest Viperine snake swimming, quite surprising since the water was very cold. 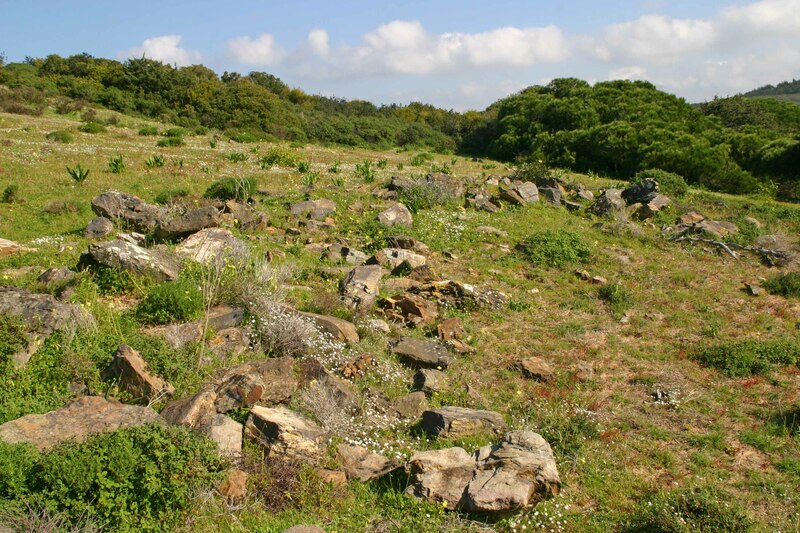 Joao then told us about a cistern where he had seen a large Grass snake (Natrix natrix), a rare species in the Algarve. Although the chances of finding this snake were very slim, we decided to visit the cistern to see what was around. Searching for around 30mins we could only find some more tree frogs and a large common toad that we rescued from inside a well. After a relatively unsuccessful day we went for our evening meal before heading to some ponds after dark. Here we were finally able to catch some adult Ribbed newts (Pleurodeles walti), in the end we found 8 adult individuals (4 caught by Mirjam), although it was again a very cold night, about 4-5C. After our successful night of newt catching there remained only one amphibian to find in the area: Parsley frog (Pelodytes ssp). But after having thoroughly searched their breeding ponds at night, we were not hopefully of finding this species. So instead we tried to find some snakes on this day by re-visited some coastal areas on the Atlantic. After walking around some sandy areas we came across a big pile of stones, lifting all of them we found very little, until Carl lifted a smaller rock away from the main pile, and we couldn’t believe what was beneath it: a Parsley frog!! We couldn’t find any sign of water around in this area so it was a great surprise to find this frog after all. Moving on to another stone covered hillside I found a reddish Common toad, and by flipping more stones I found two Southern smooth snakes (Coronella girondica). We did however fail to find a False smooth snake (Macroprotodon brevis) a species that Carl had not seen before. We were pretty tired after the intense rock lifting we had been doing to find a snake, and went for an afternoon break at a local cafe. Stopping on the coast to turn some more rocks, the only interesting species we saw were several Lesser Kestrels. As evening began to draw near we decided to drive to ‘our’ midwife toad spot for a short nocturnal search. Again the little toads were beeping like mad to each other, but the first animal we found was a Spanish terrapin (Mauremys leprosa) wandering around in the dark. Soon afterwards I managed to track down a male midwife toad as it was calling. I'm sure I recognise this pile of rocks from another European herpers field report?? Perhaps that of the Holy father of European Herpetology? Our last day in the Algarve, with nice sunny weather and the warmest day of the trip. We took things a little easier, and searched quite close to our accomodation. Under a stone slab at the side of a road we found four Natterjack toads and a few worm lizards. We then stopped to explore an old ruin near the sea, here we found Large psammodromus, only our second Painted frog, and under some stones, 10 Ribbed newts. The area was very dry and clearly these amphibians were waiting for some consistant rain before they left their shelters. Our final search was at a coastal pine forested area, where we found two more chameleons, a juvenile and a large adult. Mirjam and her husband Onno invited us for tea at their place in the evening, and after a fantastic meal we had a quick look in a pond near Mirjam’s house and spotted a single Ribbed newt. We thanked Mirjam for all of her help and we made our way home back to Liverpool early the following morning. Overall we had a successful trip to the Algarve, and since amphibians were the main aim, we were very pleased to find all 12 species found in the area. However, with not a drop of rain we did not see some species in the plague-like numbers that one can sometimes expect during the winter in this area. Some species proved very tricky to track down for whatever reason, notably the Southern marbled newt (Triturus pygmaeus), Painted frog (Discoglossus galganoi) and Parsley frogs (Pelodytes ssp). Although the weather was occasionally warm, I believe the cold nights affected reptile activity at this time of year, whereas chameleons were tempted out by the afternoon sunshine, most other lizards and snakes did not appear to be active at all. However, our only real ‘failure’ was to find Macroprotodon brevis, a species that can still be found frequently under stones throughout the year. Parsley frog (Pelodytes ssp) for now this species from the Algarve is not surely recognised as ibericus, punctatus or something new altogether. Hopefully this will soon be clarified..
Maria’s worm lizard (Blanus mariae) 10-12 found. Now apparently a distinct ‘species’ from cinereus…….